As we inch closer to the full-electric car taking the place of gasoline-fueled cars, we are seeing a transition to plug-in hybrids. 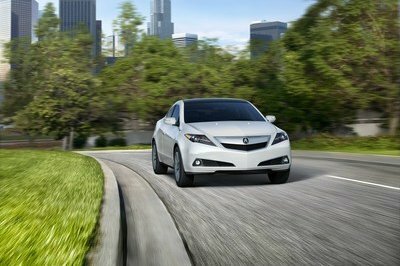 These models give buyers a short EV distance and a standard hybrid setup for longer journeys. 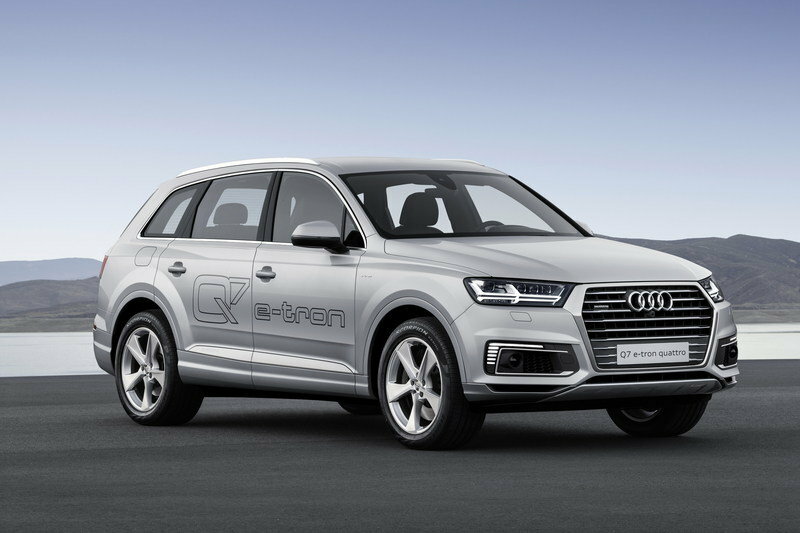 The Audi Q7 has already joined these ranks with the 2016 Q7 e-tron 3.0 TDI at the 2015 Frankfurt Auto Show, and now it is spreading the e-tron love to China with the Q7 e-tron 2.0 TFSI. I don’t know exactly why Audi decided to use a different engine in the China-spec Q7 e-tron, but I can only assume that it is because diesel engines are not popular there. In the U.S., we’ve had the same issues with diesel vehicles, but Audi’s never been overly shy about offering diesel-powered cars here. 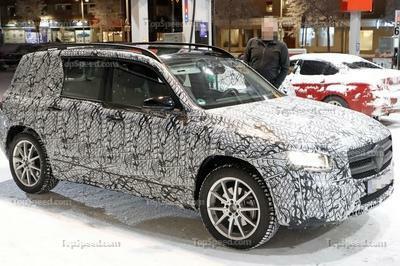 How does this China-exclusive version of the Q7 e-tron stack up next to the already unveiled TDI version? Find out by continuing to read my full review 2015 Q7 e-tron 2.0 TFSI. On the outside, the Q7 e-tron 2.0 TFSI carries all of the design cues of the standard Q7. Things like the Singleframe grille and the flared wheel arches carry over unchanged. However, a few details are specific to this fuel-sipping model, like the lightly restyled grille, the restyled air intake surrounds with LED lights, the restyled wheels, and the special rear diffuser. Like the Q7 that debuted earlier in 2015, this version has a 0.34 Cd, which helps maximize its fuel economy. Other than those few special additions to the body, the untrained eye likely couldn’t distinguish this model from the standard Q7. 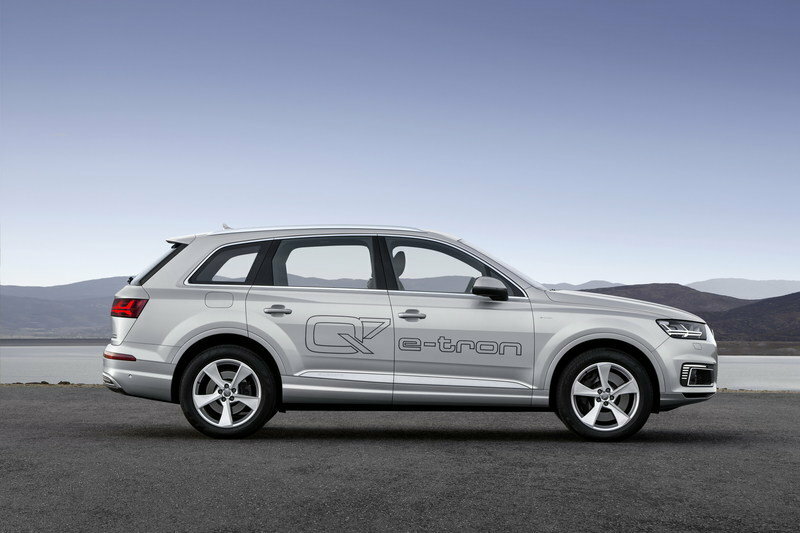 Like the exterior, the interior of the Q7 e-tron has only a few distinguishing characteristics. However, even the untrained eye may spot the differences. The key changes include a standard MMI all-in-touch system, a 3D sound system, a special section in the infotainment system that monitors the e-tron’s consumption and electric range, and a charging/precooling/preheating timer that helps get the car ready well before you ever hop in for your morning commute. Other features, like the Audi Virtual Cockpit, MMI navigation, voice controls, and tons of upscale materials all carry over from the standard Q7. 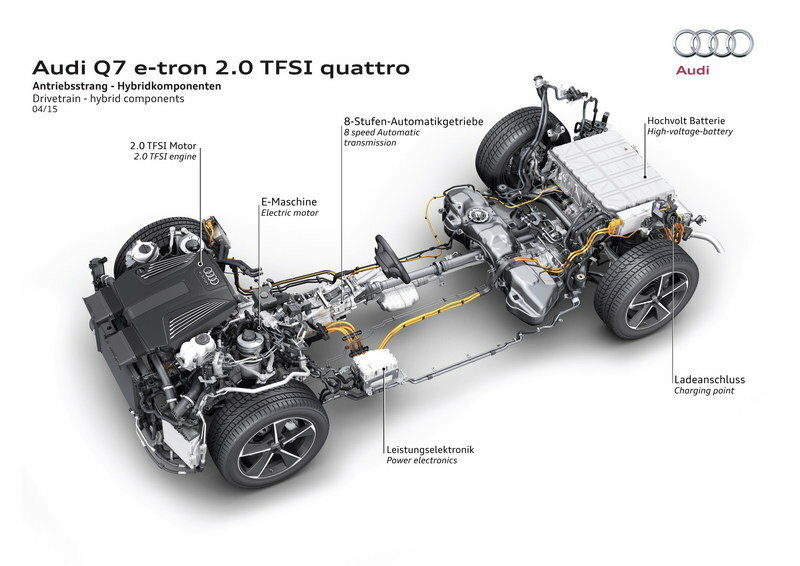 The drivetrain is the main event in the Q7 e-tron 2.0 TFSI, as this Asia-only model drops the 3.0-liter TDI engine from the European-spec Q7 e-tron and replaces it with the 2.0-liter TFSI engine. The gasoline engine produces 252 horsepower and 273 pound-feet of torque, while the parallel hybrid system adds another 126 horsepower and 258 pound-feet of torque. Altogether, this system develops 367 horsepower and 516 pound-feet of torque, which results in a 0-to-62 sprint time of just 5.9 seconds and a top speed of 136.7 mph. With gasoline and electric power combined, this crossover can travel up to 633.8 miles between fill ups. An eight-speed tiptronic transmission handles all of the shifting duties, while the quattro all-wheel-drive system assures maximum traction. 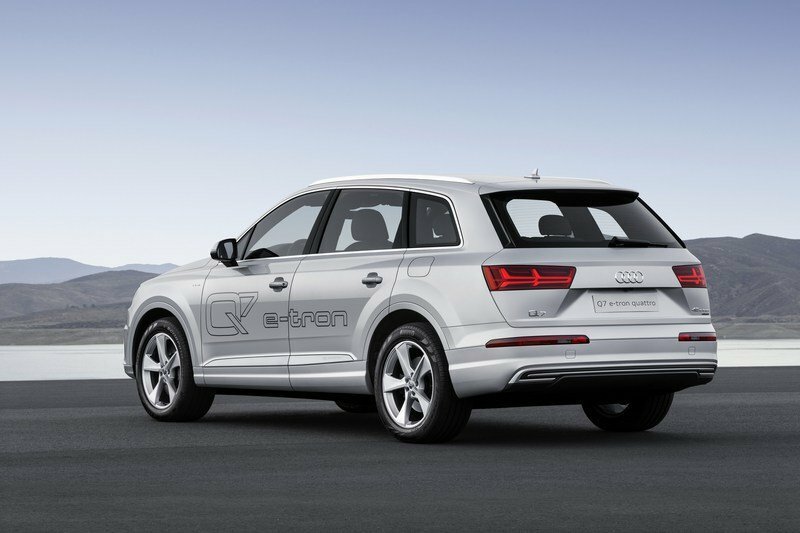 Despite being powerful and fast, the Q7 e-tron 2.0 TFSI gets 94.1 mpg-e and emits only 96.6 grams of CO2 per mile. What’s more, the Q7 e-tron 2.0 TFSI can travel up to 32.9 miles on electric power alone, thanks to its 17.3 kWh battery that recharges in as little as 2.5 hours. With gasoline and electric power combined, this crossover can travel up to 633.8 miles between fill ups. Drivers get to choose between four driving modes: EV, Hybrid, Battery Hold, and Battery Charge. EV mode is the default-starting mode for the Q7 e-tron, as the SUV always launches from a stop in this mode and it does not allow the 2.0-liter engine to kick in until the driver presses the gas pedal beyond a specific point. Hybrid mode combines the electric motor and gasoline engine for most driving, but when the Q7 is coasting, the engine acts as a generator to recharge the battery. The Battery Charge mode charges the battery every time the driver lifts his foot off the gas pedal, and a paddle on the steering wheel allows the driver to regulate the energy recuperation. Audi didn’t outline the Battery Hold mode. Audi has not released any pricing details yet, but it will only offer this model in China, so forget about seeing it in America. 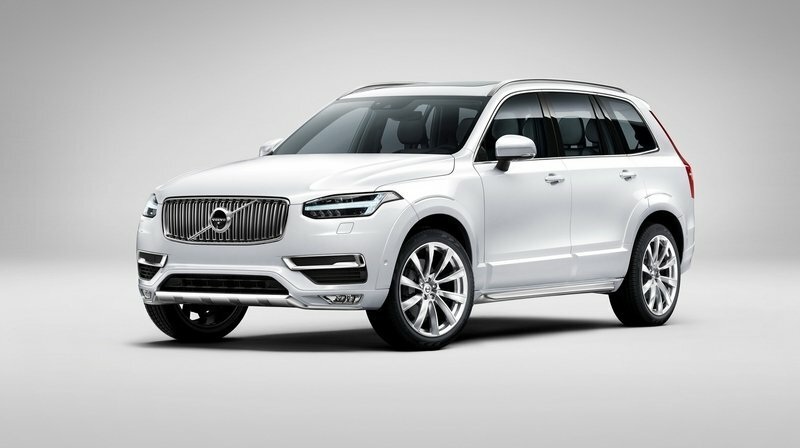 Meet the Volvo XC90 T8, the 400-horsepower, 59-MPGe hybrid SUV. The Volvo XC90 T8 is a huge step forward for Volvo and all seven-passenger SUVs, as it proved not only that the brand was set to revolutionize the industry, but also that a seven-seat SUV can be economical. Powered by a 2.0-liter four-cylinder engine and an electric motor driving the rear axle, this twin-engine people hauler produces a mighty 394 horsepower, sprints to 60 mph in just 5.7 seconds, and can travel 17 miles on electricity alone. On top of being fast, the XC90 T8 is loaded with all sorts of premium wares. The base model alone comes with leather seating, electric seat cushion extensions, a crystal gear shifter, and LED headlights. With all of this luxury and tech comes a steep price, as the XC90 T8 starts from $68,100 in the U.S. 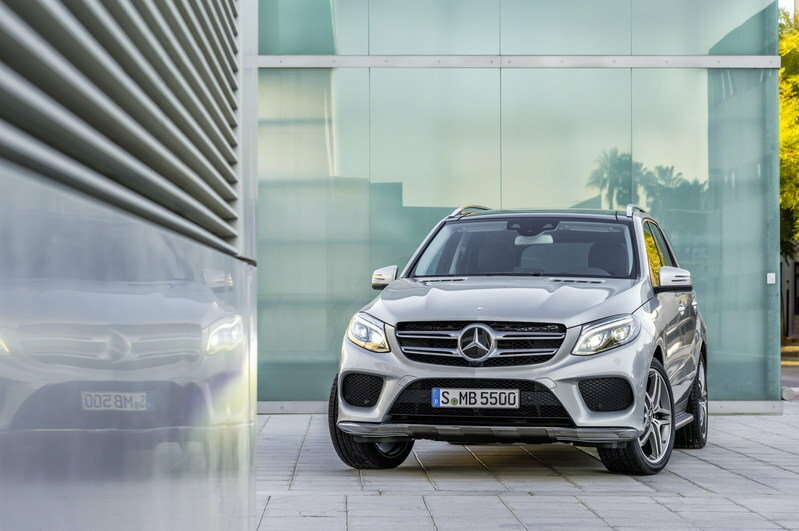 The Mercedes GLE 500 e plug-In hybrid is still very much in its infancy, as it was only recently unveiled at the 2015 New York Auto Show. It uses a twin-turbocharged, 3.0-liter V-6 engine that produces 333 horsepower and an electric motor that adds another 166 horsepower. The entire system’s output is a massive 442 horsepower and 479 pound-feet of torque, while the 8.8 kWh lithium-ion battery gives it an all-electric range of 18 miles. It hasn’t been EPA-rated yet, as the model will reach the U.S. market sometime toward the end of 2015.The rest of the model is typical Mercedes-Benz. This means gobs of luxury and a price tag a bit north of all its competitors. I love the fact that Audi is diving into the e-tron project with both feet, and this model is particularly intriguing because of its mixture of speed, sexiness and fuel economy. I am wondering if Audi is spreading itself out a little too quickly. To build a low-volume model like this specifically for China seems a bit of a risk, but I am sure that the bean counters have done their due diligence to make sure that the chances are good for success. The Audi Q7 e-tron 2.0 TFSI quattro marks the first time that Audi has combined a TFSI plug-in hybrid with quattro all-wheel drive. Audi developed it specially for Asian markets (China, Singapore and Japan). It is sporty, comfortable and at the same time supremely efficient. It accelerates from 0 to 100 km/h (62.1 mph) in under six seconds while consuming just 2.5 liters of fuel per 100 kilometers (94.1 US mpg) according to the measurement method specified in China for plug-in hybrid vehicles (PHEV). Audi is presenting the Q7 e-tron 2.0 TFSI quattro at Auto Shanghai. According to the measurement method specified in China for PHEVs, the large SUV can cover up to 53 kilometers (32.9 mi) solely on the electricity stored in its lithium-ion battery – quietly, powerfully and with zero local emissions. Total range is 1,020 kilometers (633.8 mi). 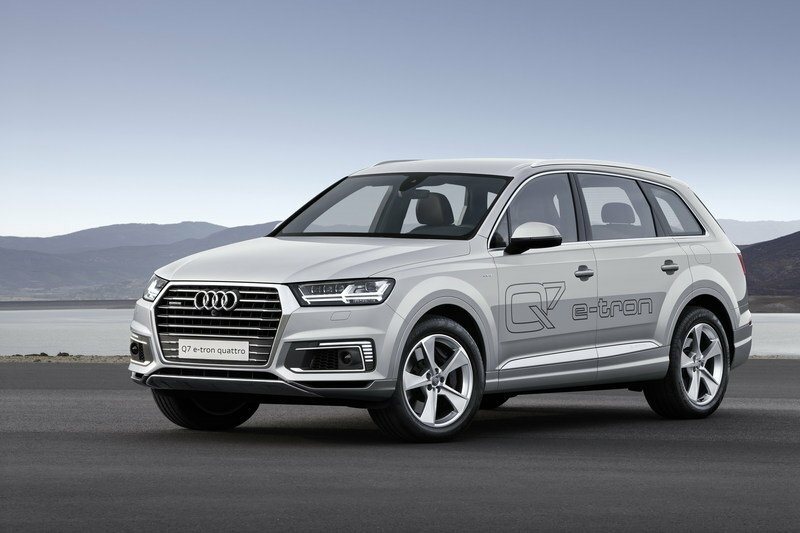 The Audi Q7 e-tron 2.0 TFSI quattro will be available beginning in 2016. The Audi Q7 e-tron 2.0 TFSI quattro has sporty power. Its 2.0 TFSI and electric motor deliver 270 kW (367 hp) and 700 Nm (516.3 lb-ft) of system torque – enough to accelerate from 0 to 100 km/h (62.1 mph) in 5.9 seconds and for a top speed of 220 km/h (136.7 mph). The standard consumption of 2.5 liters of fuel (94.1 US mpg) corresponds to CO2 emissions of less than 60 grams per kilometer (96.6 g/mi) and is a new best value in the segment. The standard thermal management system with integrated heat pump has been specially developed for the plug-in hybrids of the Q7 family*. Audi is the first manufacturer worldwide to market this technology, enabling the brand to establish a new benchmark with respect to electric range, interior comfort and air-conditioning system efficiency. The Audi Q7 2.0 TFSI e-tron quattro scores with luxury-class comfort features and the largest interior in its field of competitors. The balanced chassis, optionally available with adaptive air suspension, combines excellent ride comfort and sporty handling. Audi sets additional standards with the display and operating concept of the standard Audi virtual cockpit and a newly developed MMI system. Operation of the standard MMI navigation plus system is extremely convenient using the MMI touchpad or simplified voice control. 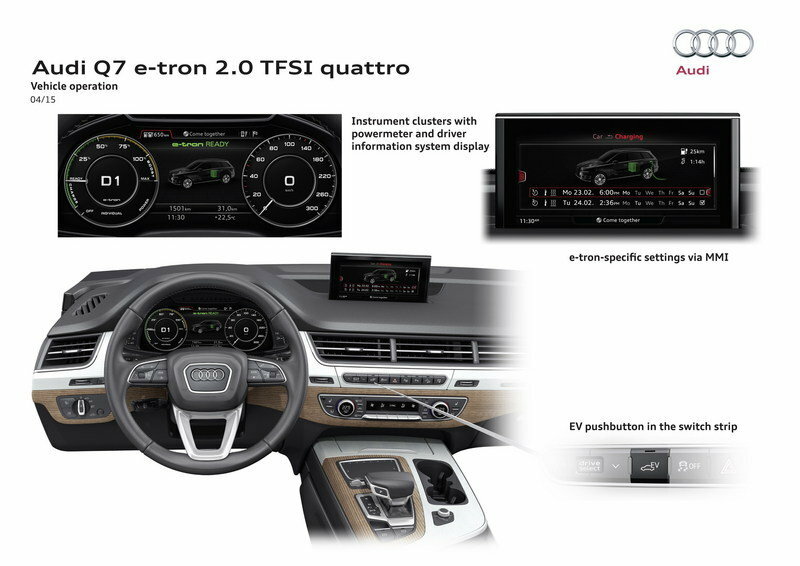 The infotainment system in the Audi Q7 e-tron 2.0 TFSI quattro is tightly integrated into the hybrid management system. In hybrid mode, the system uses the navigation data – including long-range data – to select the most fuel-efficient combination of drive modes along the route to the destination. The new Audi Q7 e-tron 2.0 TFSI quattro boasts sporty talents, which it puts on display both in town and on the open road. The new electromechanical power steering is highly efficient as well as sensitive. The five-link wheel suspension, also newly developed, on the front and rear axles are more than 60 kilograms (132.3 lb) lighter than the axles on the conventional Q7 predecessor model, and greatly contribute to the high driving dynamics. The lowered center of gravity also plays an essential role here. 270 kW (367 hp) system output and 700 Nm (516.3 lb-ft) system torque: The Audi Q7 e-tron 2.0 TFSI quattro has been specially designed for Asian markets (China, Singapore and Japan) and sets new standards using plug-in hybrid technology and quattro all-wheel drive. The large SUV accelerates like a sports car from 0 to 100 km/h (62.1 mph) in 5.9 seconds, but consumes no more than 2.5 liters of fuel per 100 kilometers (94.1 US mpg) according the measurement method specified in China for plug-in hybrid vehicles (PHEVs) – a best value in its class. The Audi Q7 e-tron 2.0 TFSI quattro is the world’s first plug-in hybrid car combining a TFSI engine with quattro all-wheel drive. With a system output of 270 kW (367 hp) and 700 Nm (516.3 lb-ft) of system torque, it accelerates from 0 to 100 km/h (62.1 mph) in just 5.9 seconds, and continues up to a top speed of 220 km/h (136.7 mph). According to the measurement method specified in China for PHEVs, the large SUV consumes just 2.5 liters of fuel (94.1 US mpg), corresponding to less than 60 grams CO2 per kilometer (96.6 g/mi). This value too sets new standards. 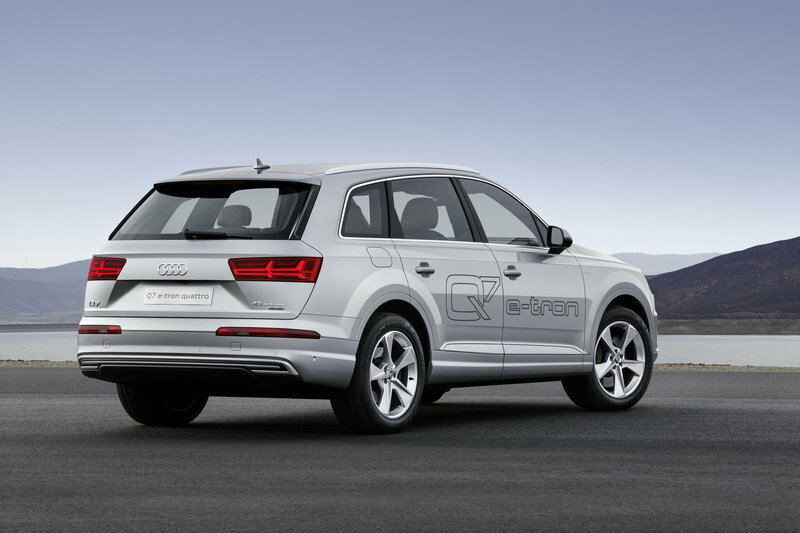 Like all Audi hybrid models, the Q7 e-tron 2.0 TFSI quattro has also been designed as a parallel hybrid. Its 2.0. TFSI, a highly efficient, latest-generation four-cylinder engine, delivers 185 kW (252 hp) of power and 370 Nm (272.9 lb-ft) of torque. Active engine bearings use targeted counterpulses to eliminate undesirable vibrations. The disk-shaped electric motor provides 94 kW and 350 Nm (258.1 lb-ft) of torque. Together with a decoupler, it is integrated into the eight-speed tiptronic. The automatic transmission is outstanding for its high efficiency and low weight. The quattro permanent all-wheel drive system distributes the power to all four wheels. During fast cornering, its center differential works closely with the torque vectoring system, an intelligent software feature. Another highlight of the Q7 e-tron 2.0 TFSI quattro is the standard Audi virtual cockpit. The all-digital instrument cluster with 12.3-inch display presents all key information in impressively high-quality graphics. The driver can retrieve different levels of information, including specific e-tron displays such as the powermeter. In addition, the instrument cluster offers displays for the energy flow in electric mode, the range (with numbers and graphs) and the charge level of the battery. The lithium-ion battery consists of 168 high-performance battery cells and is fluid-cooled. With a capacity of 17.3 kWh, it allows a range of 53 kilometers (32.9 mi) in electric mode according to the measurement method specified in China for PHEVs – another record in the segment. The total range is 1,020 kilometers (633.8 mi). Another efficiency component is the standard thermal management system with integrated heat pump, specially developed for the plug-in hybrids of the Q7 family. This makes it possible for the waste heat from the electrical drive components to be made available to the interior. Audi is the first manufacturer worldwide to bring this technology to a production plug-in hybrid, enabling the brand top set new standard with respect to interior comfort, air-conditioning system efficiency and range in purely electric EV mode. Benefits for the customer include a fast-heating cabin and the ability to drive more frequently and longer on electric power alone, even in low outside temperatures. 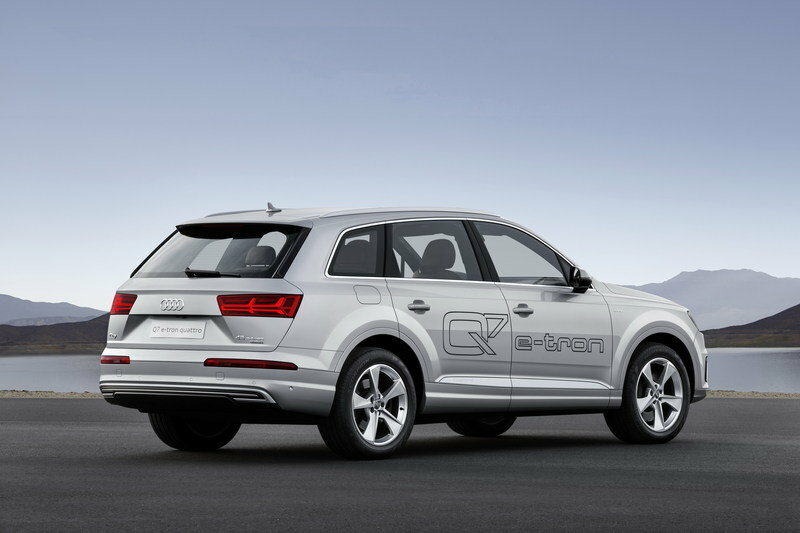 The new Q7 e-tron quattro is equipped with the new two-phase charging technology that permits charging with up to 7.2 kW of power. Depending on the infrastructure and with a correspondingly high-powered industrial outlet and charging cable, the customer can fully charge the battery in around 2.5 hours. The hybrid management system controls the operating states of the Audi Q7 e‑tron 2.0 TFSI quattro intelligently, flexibly and with high efficiency. The driver can choose between four modes. EV mode prioritizes electric driving, while in hybrid mode the hybrid management system chooses the type of drive for the most part freely. In battery hold mode, the system conserves the available electrical energy, and charges the battery in battery charge mode. The large SUV generally starts in electric mode. To activate the TFSI, the driver has to press down on the active accelerator pedal (another innovation from Audi) beyond a certain point of resistance. The point at which the resistance occurs is based on the requirements of the hybrid management system. A pressure point must also be overcome for boosting, in which case both the engine and electric motor work together. When hybrid mode is active and the eight-speed tiptronic with integrated electric motor is in D, the Audi Q7 e-tron 2.0 TFSI quattro changes to coasting mode when the driver takes his foot off the accelerator. The TFSI and the electric motor are then deactivated and restarted with no perceptible vibration once the accelerator is pressed again. When driving in battery charge mode and with the transmission set to S, the system recovers energy as soon as the driver lifts off of the accelerator. The driver can progressively influence the degree of recuperation using the shift paddles on the steering wheel. Most braking is also performed via the electric motor. The hydraulic wheel brakes are used for moderate or sharper deceleration. The standard MMI navigation plus is closely integrated into the hybrid management system on the Audi Q7 e-tron 2.0 TFSI quattro. In hybrid mode, the system uses the navigation data – including long-range data – to select the most fuel-efficient combination of drive modes along the route to the destination. The new Audi Q7 e-tron 2.0 TFSI quattro is a car with sporty talents both in town and on the open road. The new electromechanical power steering is highly efficient as well as sensitive. The five-link wheel suspension, also newly developed, on the front and rear axles are 60 kilograms (132.3 lb) lighter compared with the predecessor model, and greatly contribute to the high driving dynamics. The lowered center of gravity also plays an essential role here. Even the basic version of the large SUV rolls along gently and smoothly, while comfort is further enhanced by the optional adaptive air suspension with controlled damping. The driver can regulate the mode of operation via the standard Audi drive select dynamic handling system. It offers up to seven modes and integrates further technical components such as the steering, accelerator and automatic transmission. The new Audi Q7 e-tron 2.0 TFSI quattro also sets standards in assistance systems. New, for example, are collision avoidance assist, turn assist, cross-traffic assist and trailer assist. As an all-rounder for leisure, family, sports and business, the Audi Q7 e-tron 2.0 TFSI quattro also effortlessly masters light terrain. A tilt angle display, hill descent control, an off-road mode for the Electronic Stabilization Control (ESC) and off-road navigation are standard. The design of the new 5.05 meter-long (16.6 ft) Audi Q7* strikes a balance between a powerful, honed style and elegant understatement. Details such as the deeply sculpted singleframe grille, the striking emphasis of the wheels and the flared edges over the wheels – the “quattro blisters” – embody the brand’s DNA. All lines and surfaces are designed precisely and incisively, and accentuate the width and solidness of the car. The tailgate wraps around the steeply raked D-pillars – typical of all Q models from Audi. The Q7 e-tron 2.0 TFSI quattro features special designs for the singleframe grille, the air inlets, the 19-inch and optional 20-inch wheels and the rear diffuser. The headlights are three-dimensional, with their light signature appearing as a double arrow. LED light guides in the air inlets generate a new, characteristic e-tron signature of staggered lines that underscore the horizontals. 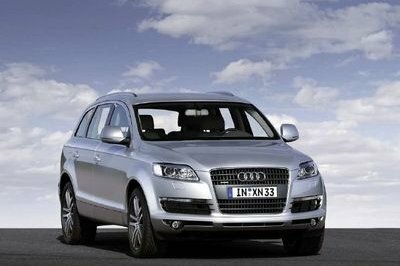 The body plays a decisive role in the relatively low weight of the Audi Q7 e‑tron 2.0 TFSI quattro. 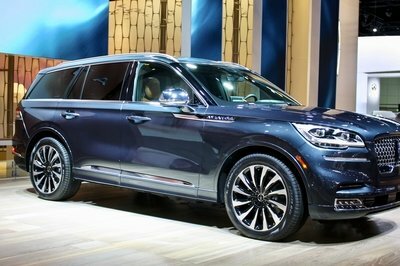 It draws on the same potential harbored by lightweight construction as the conventional Q7. The coefficient of drag is just 0.34. The Audi Q7 e-tron 2.0 TFSI quattro offers the largest interior in its segment. The three rear seats have adjustable backrests and can be moved fore/aft as desired. The lithium-ion battery is mounted in such a way as to take up as little space as possible. Design elements like the wrap-around – the long arc around the driver and front passenger – the trim strips and the panel of air vents emphasize the generosity of the interior. The two-part trim areas allow many individual combinations; the range of upholstery is of luxury-class standard. New to the Q family are premium Audi design selection materials color-coordinated to the finest detail. Audi also uses the latest technology from consumer electronics in the area of infotainment. Its main element is the second-generation modular infotainment platform, which utilizes the enormous computing power of the Tegra 30 graphics chip from NVIDIA. Operation is by voice, with the multifunction steering wheel or with the completely newly developed MMI terminal, the MMI touchpad. Audi equips all Q7 e‑tron models with the MMI all-in-touch, the touchpad with haptic feedback. The supplemental infotainment modules are innovative: the Audi tablet, which serves as Rear Seat Entertainment, the 3D sound systems from Bose and Bang & Olufsen, and the new Audi phone box that inductively charges cell phones and significantly improves reception quality by connecting to the exterior antenna. Audi has also added specific items to infotainment for displays in electric mode. For example, consumption statistics are available along with a graphic display of the electric range in the navigation map. 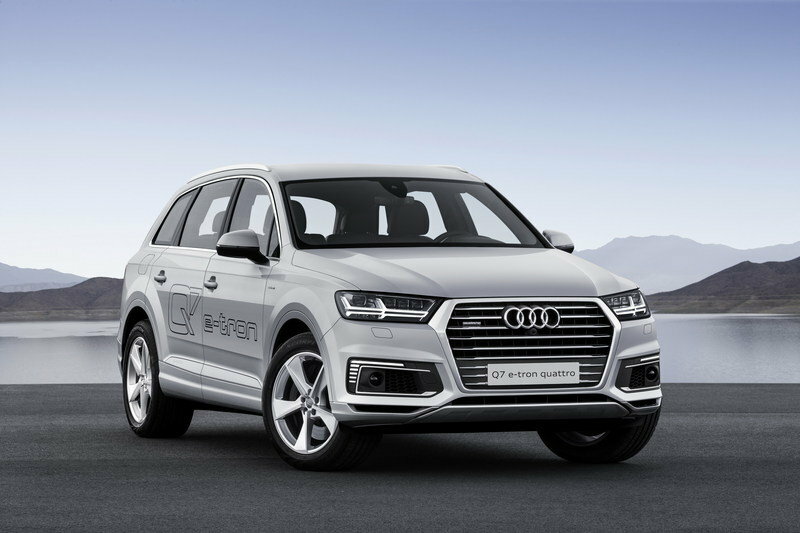 Owners of the Audi Q7 e-tron 2.0 TFSI quattro can use a timer to start the charging and precooling/preheating processes, thus adapting these to the desired departure time to conserve resources and reduce costs. The Audi Q7 e-tron 2.0 TFSI quattro comes with the standard equipment of a top model. Its special features include the Audi virtual cockpit, MMI navigation plus with online updates of the navigation map, MMI all-in-touch and 19-inch wheels. The automatic air conditioning is also a tailored solution. It operates in unison with a heat pump that utilizes the waste heat of the electrical drive components for thermal management. As an important efficiency element, it is another great innovation in the Audi Q7 e-tron, heating up the interior faster at low temperatures than a conventional solution, for example, to extend the electric range by up to 20 percent. 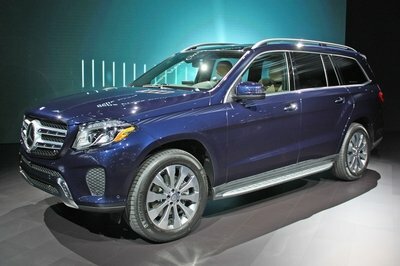 Options for the SUV include a head-up display, tinted privacy glazing and a panoramic glass sunroof. If desired, the driver and front passenger can sit on climate-controlled, customized contour seats with massage function.